Let’s start where we left off in Little Milly’s kitchen to see the bedrooms on the upper levels. 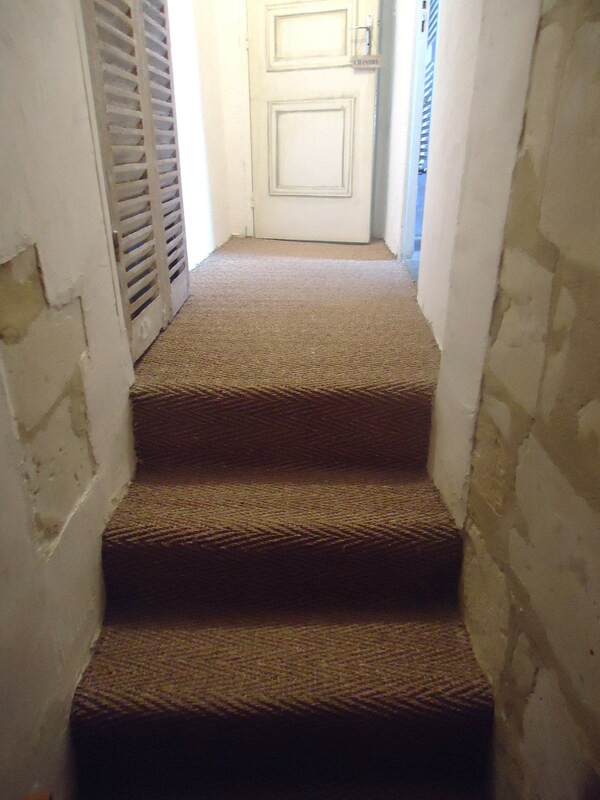 We are going down the steps from the kitchen and up the steps to the second floor. 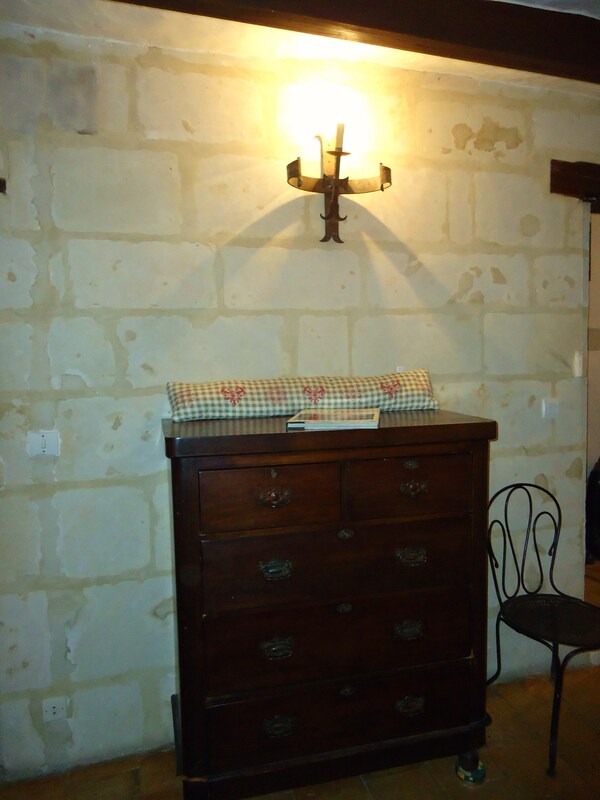 The linen chest and medieval looking iron sconce in the second floor hallway. 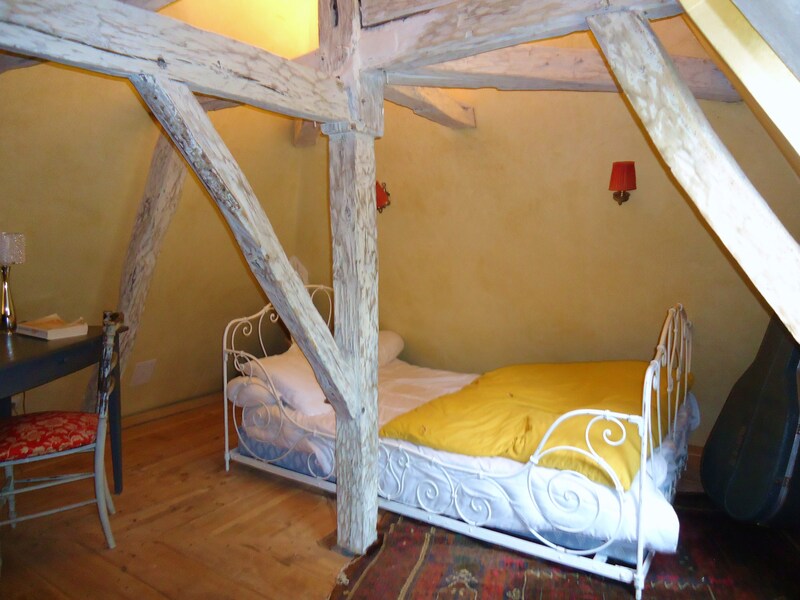 Looking into one of the bedrooms. A wonderful chippy green finish on the old armoire which serves as the room’s only closet. 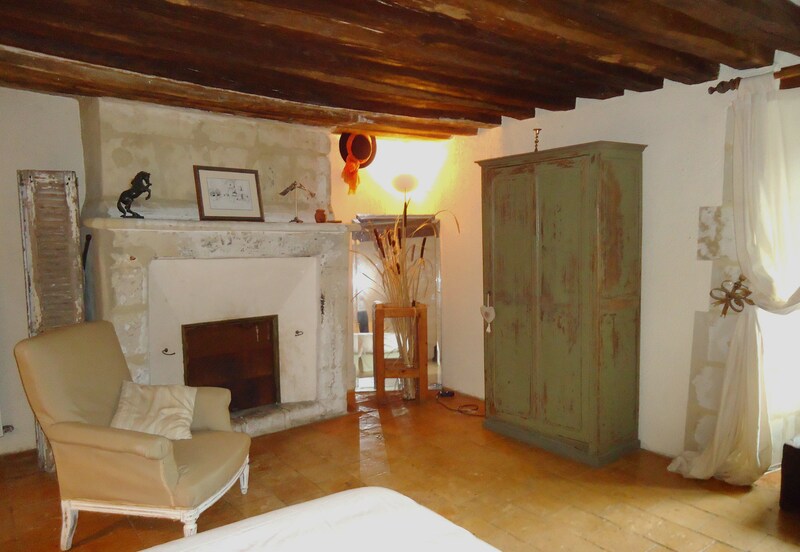 The limestone fireplace and old beams just add to the charm. These tabbed side panels are held back by metal ribboned tie backs with a wonderful patina. My son picked this room because of the TV. Much to his dismay he discovered that every channel was in French. Great! I was so pleased. More family time for him! You can see one of the many limestone houses from this window. 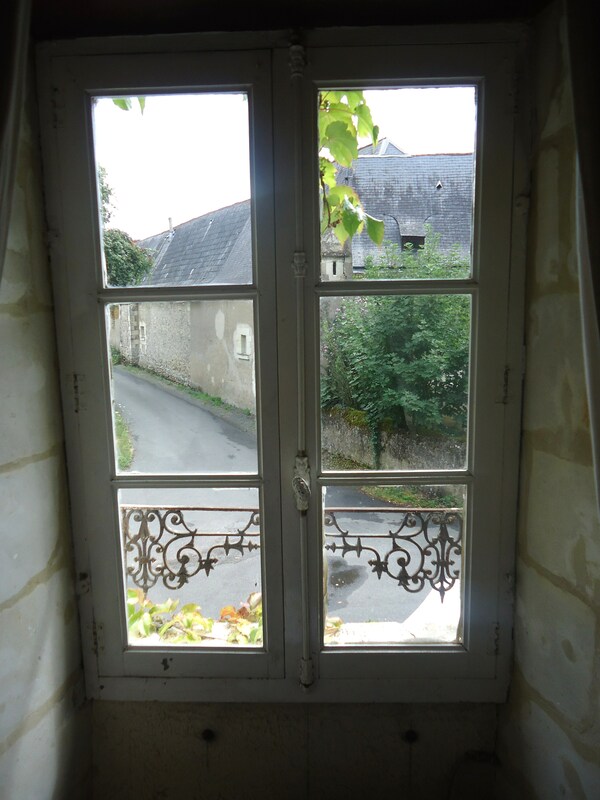 I never tire of the lovely old ironwork that is everywhere in France. A peek behind most of these homes is likely to yield a field and a horse or two. — The padded headboard has two ribbons tied into bows which hold together the vertical inverted pleats, contrasting the horizontal whitewashed planks on the wall. These planks are repeated on the wall of the adjoining hallway. Off the 2nd-floor hallway are the stairs to the 3rd- and 4th-floor bedrooms. 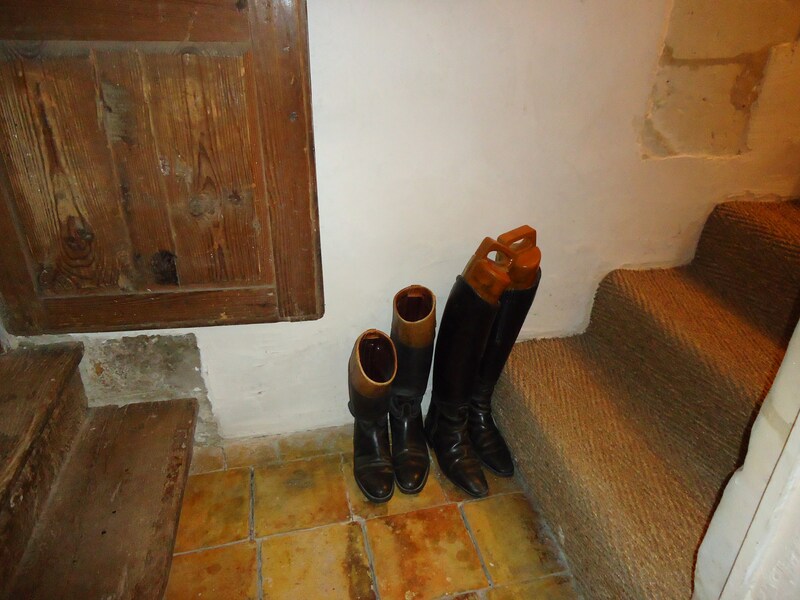 These riding boots may belong to the owner who is a rider of the Cadre Noir de Saumur, which is at the French National Riding School located in nearby Samur. Wall-to-wall sisal looks great and makes things a bit warmer. 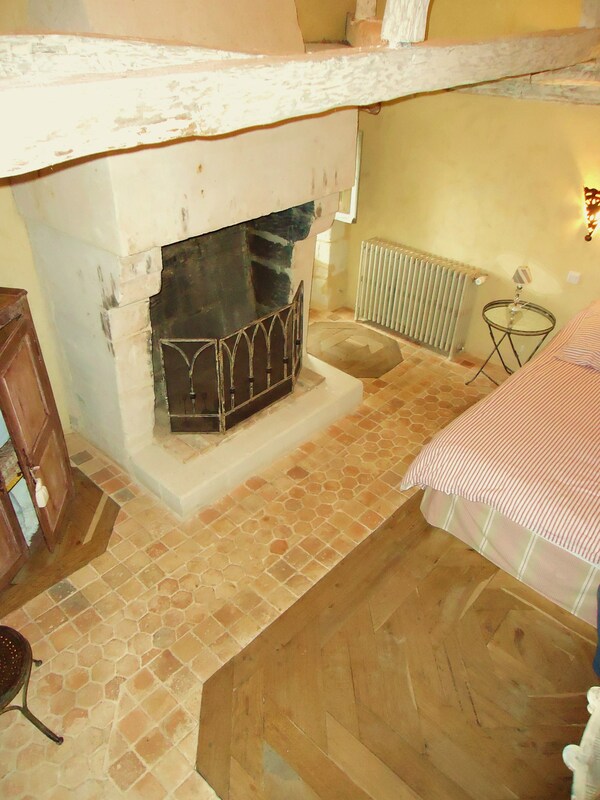 The old stone floors were really quite cold even in the summer. 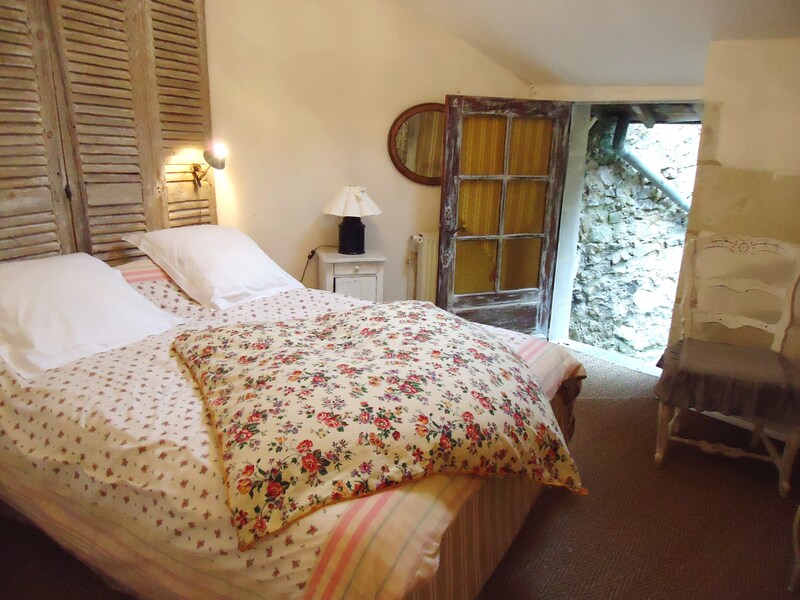 Exposing a bit of the old wall under the plaster is a nice touch. 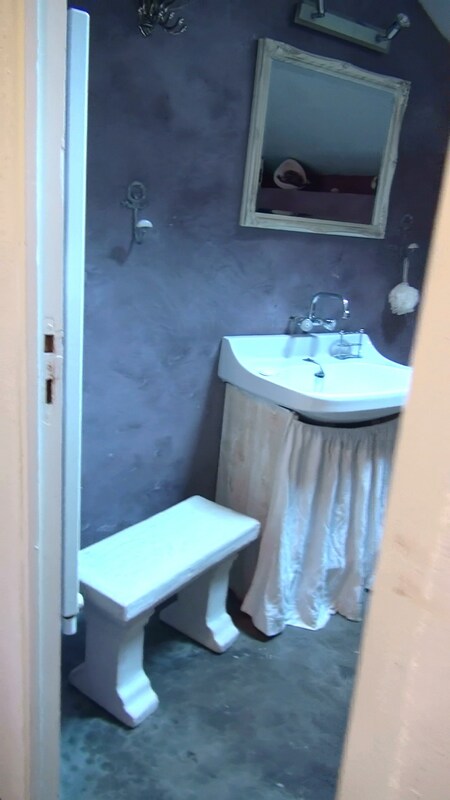 The very purple bathroom off the hallway. 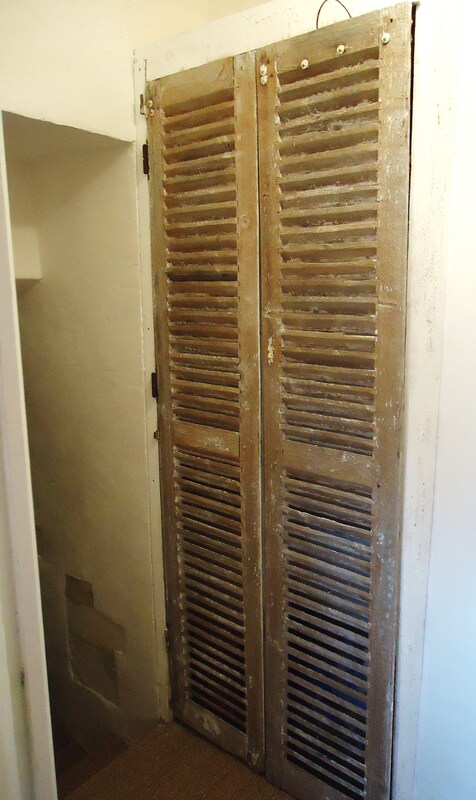 This closet across from the bathroom has great old shutters for doors. 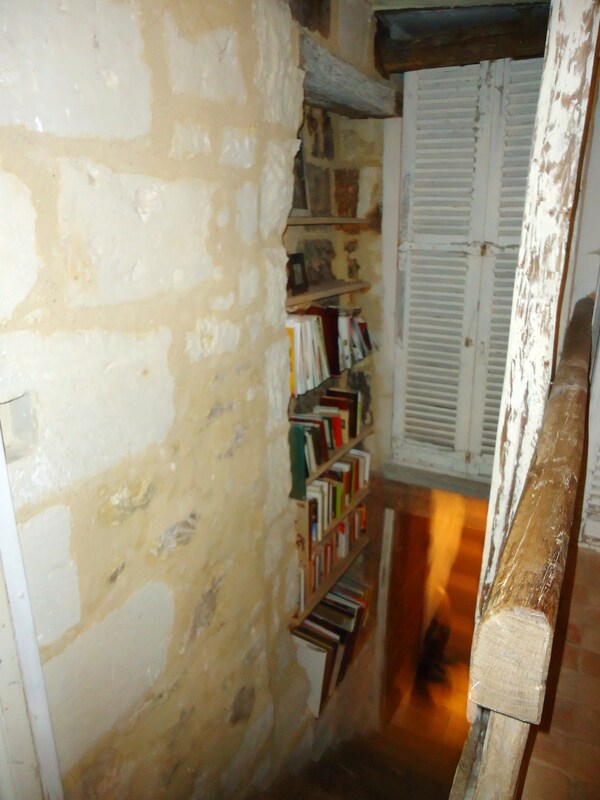 The closet was built onto the wall with narrow planks of wood. Old houses don’t have closets. 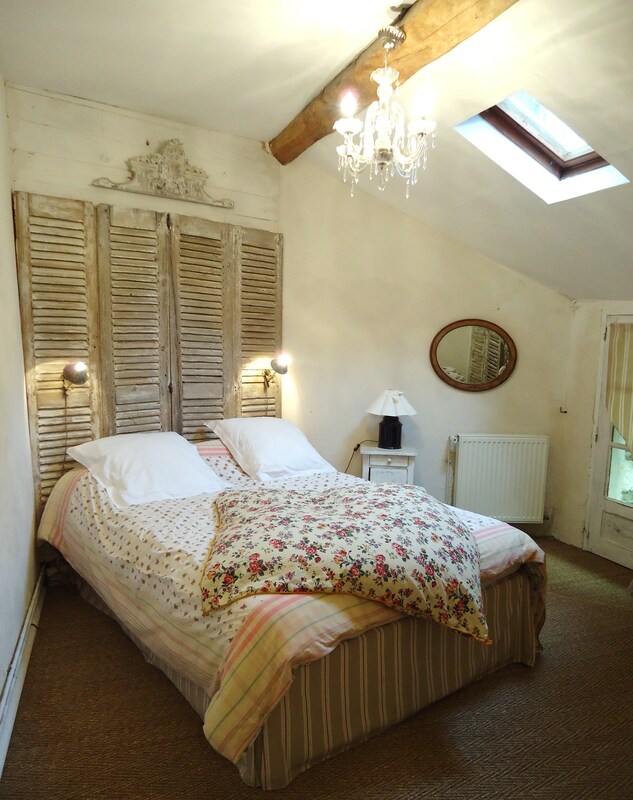 The old shutters turned headboard look great topped off with the decorative carved pediment. This bedroom looks so sweet with the small crystal chandelier. 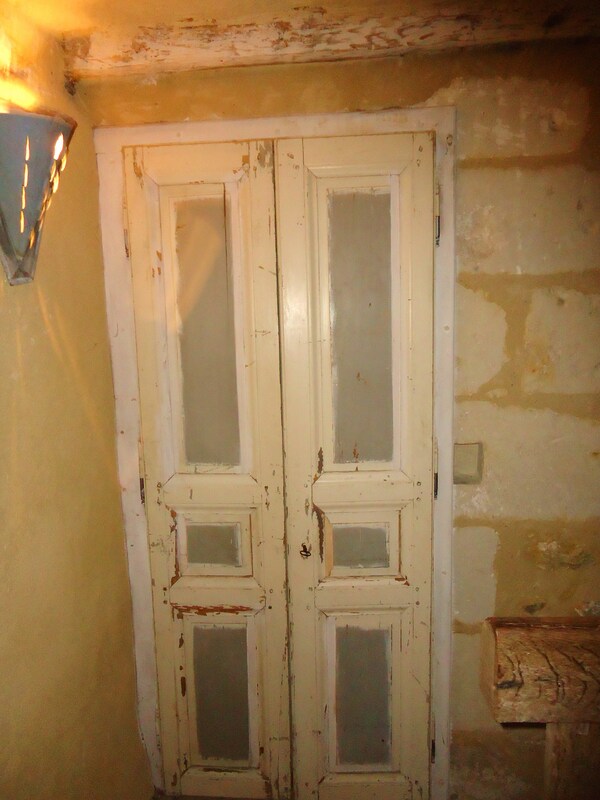 Nicely distressed door with typical French window treatment. 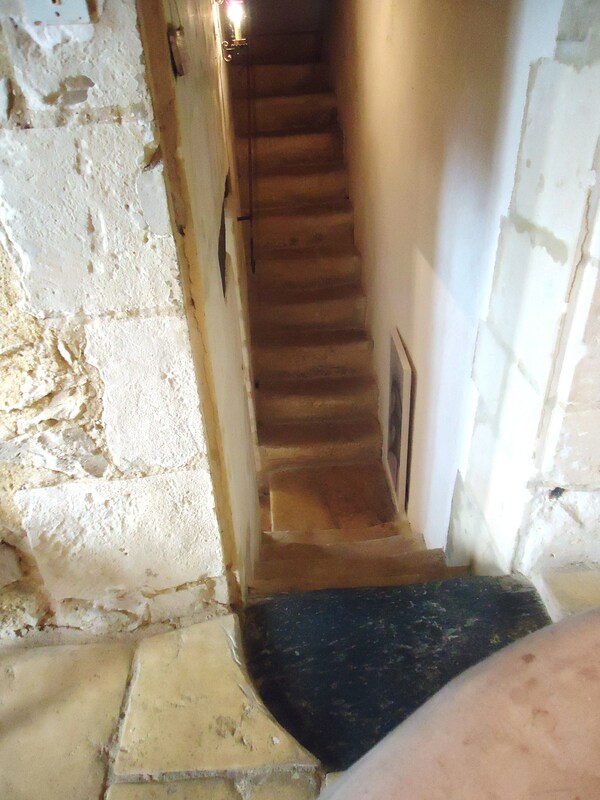 If you are over 5 ft. tall you have to duck to go through this doorway to go down the old stone steps to the rear courtyard. Yep, you really have to duck. Another closet constructed of old shutters. 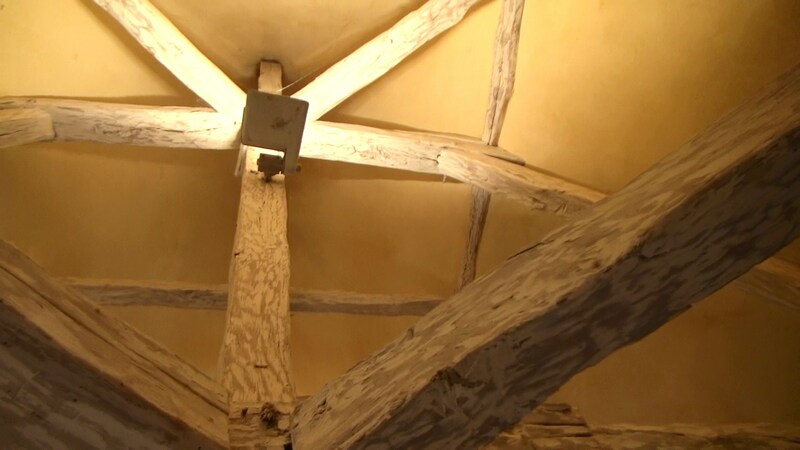 — Below is a video of the church bells that rang 100 times every morning and evening at 8 o’clock. Who needs a rooster in the French countryside when you have church bells! They tolled on the hour throughout the day as well–can’t lose track of time here! Leaving this bedroom you face the weathered looking door to the stairs leading up to the enchanting master bedroom! 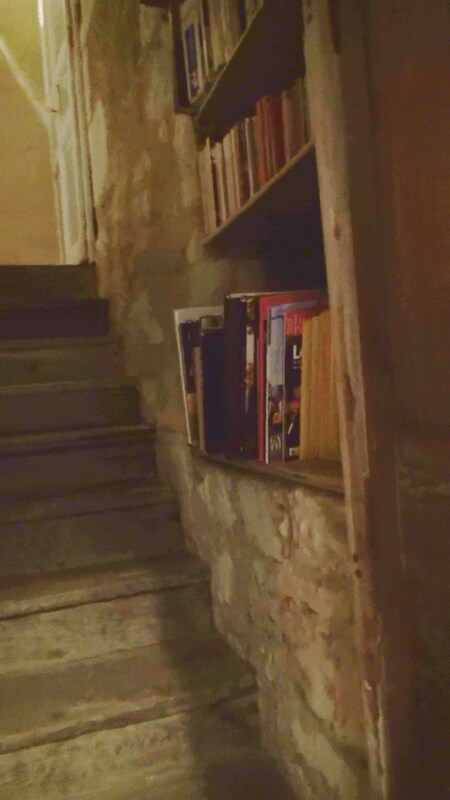 — The old creaky wooden stairs and a built-in bookcase in such an unlikely place. Looking down the stairwell. 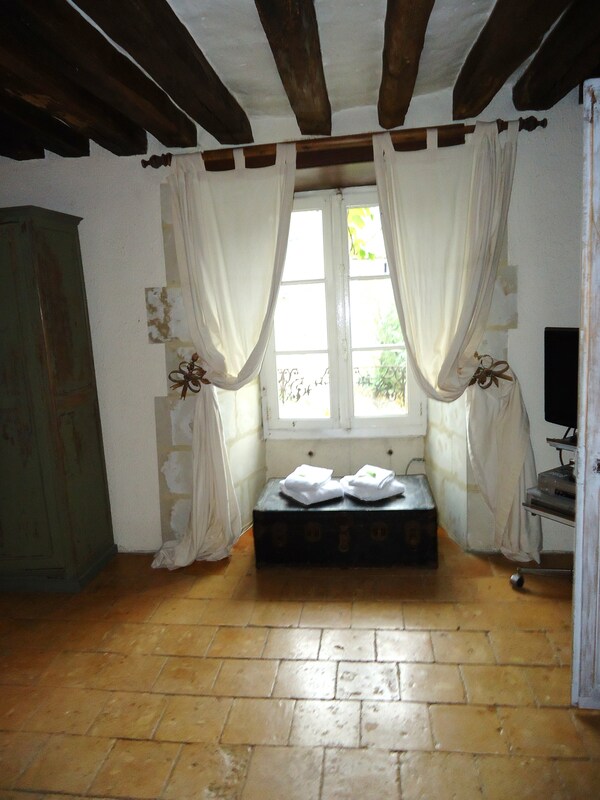 The shutters are a wall to the master bathroom. 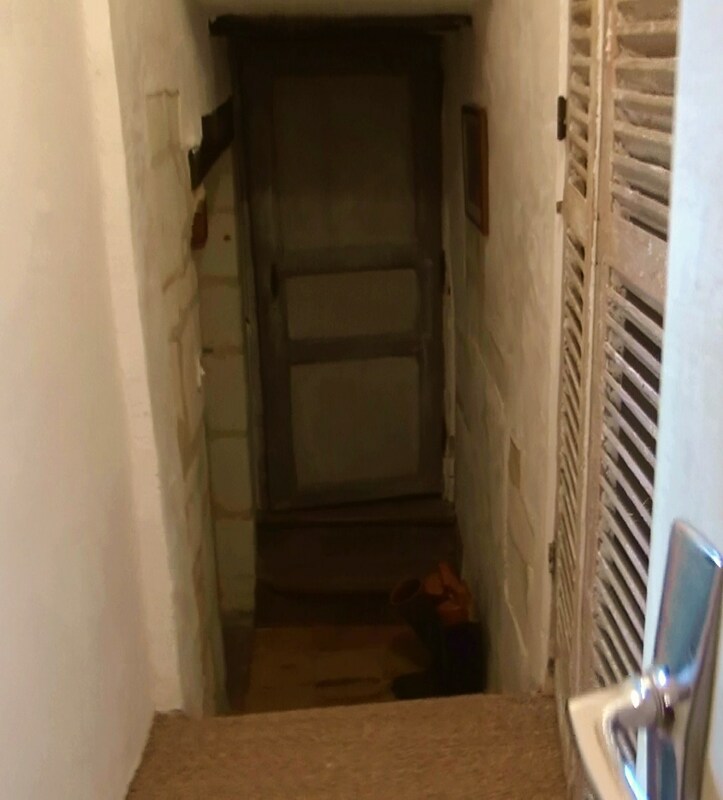 The shallow closet at the top of the stairs with chippy double doors. 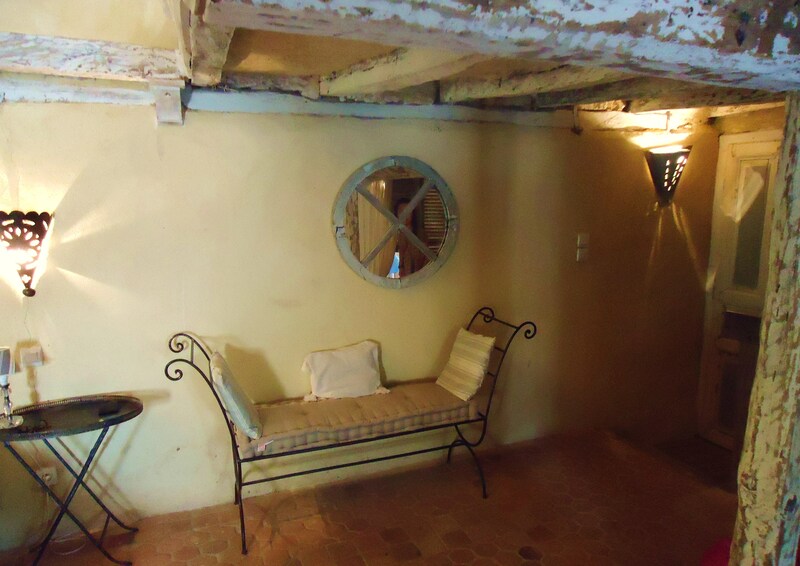 An iron bench at the top of the staircase and under the loft. Now this is so enchanting……. 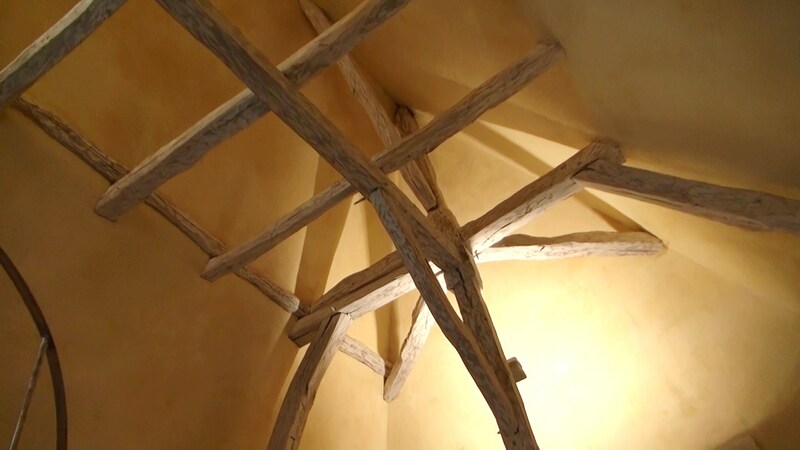 The soaring ceiling with whitewashed beams. What a great view first thing in the morning! It is interesting how they up lit the beams. 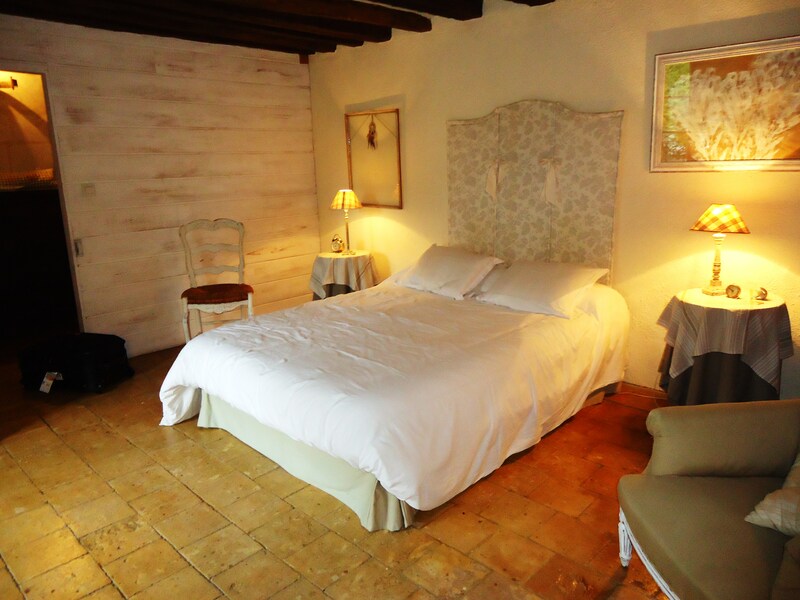 The room glowed with all of the washed yellow plaster walls and great lighting. 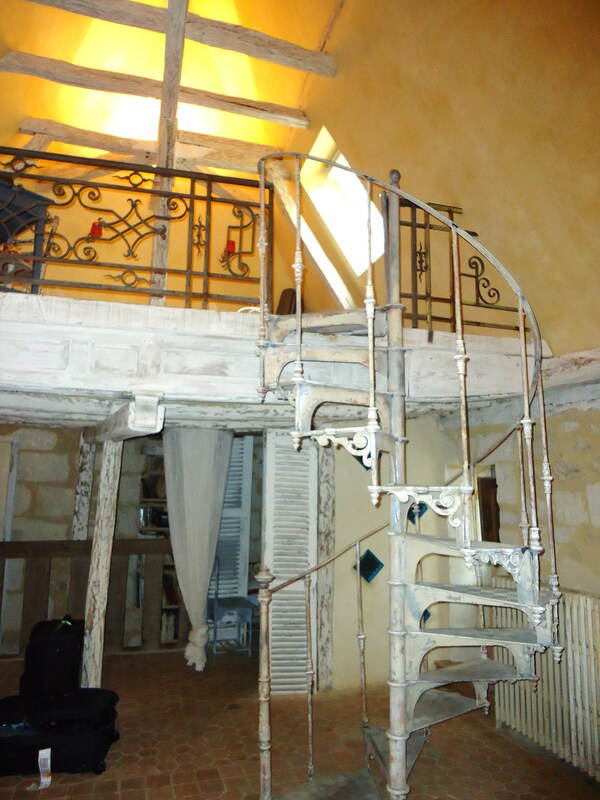 Love the loft staircase and ironwork railing. The French are known for their old-world artistry when working with metals. Their skills are passed down from generation to generation. The small diamond-shaped windows beyond the staircase adorn the master bathroom’s shower. 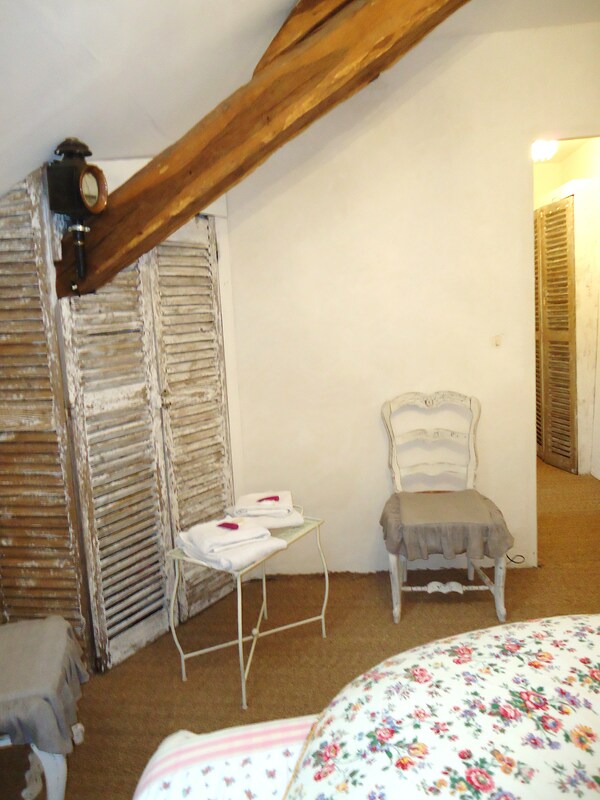 A charming iron bed and desk in the loft. 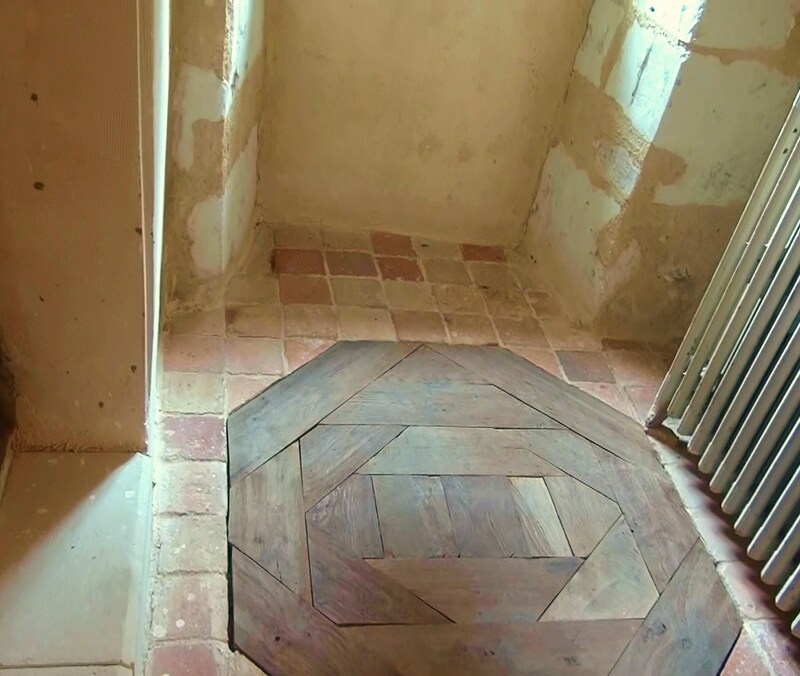 The floors are extraordinary! Need I say more. Can you just imagine this fireplace ablaze on a cold winter’s evening? Interior shutters for keeping out the cold or sunlight. 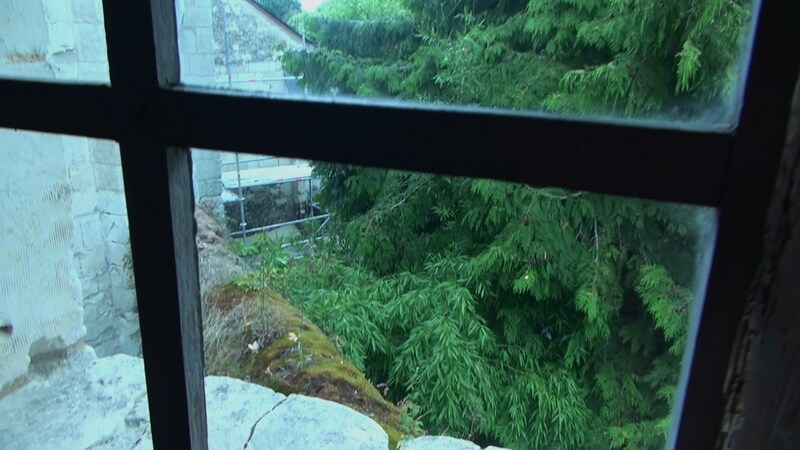 View of the church from the little window (scaffolding because of repairs) and a moss-covered wall. This metal sink is darling. I think it may be copper. There are small limestone ledges that hold the faucets on either side. 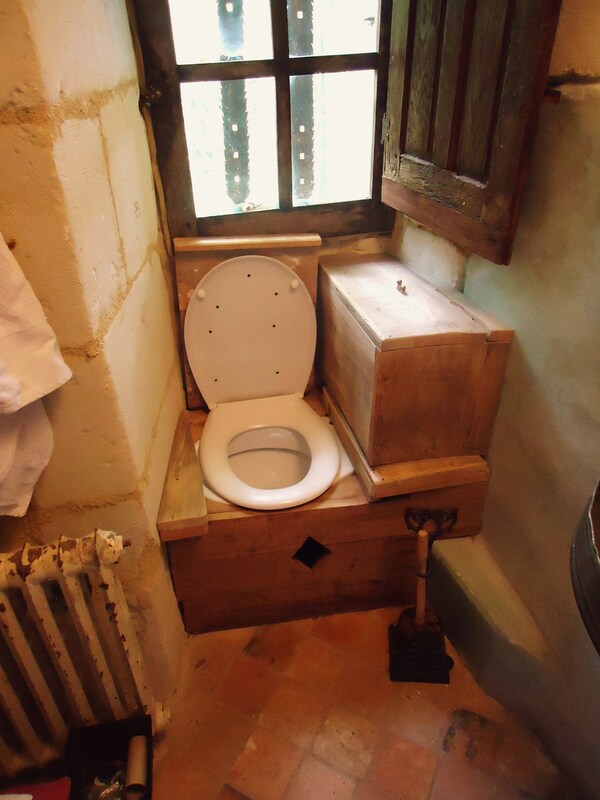 Oh my, is that a wooden toilet? Yep, it’s wooden all right. Americans hide their toilet bowl brushes. The French – well they display them like a piece of art! Why move the pipes in an ancient house when you can just turn the toilet seat. I think this is ingenious. Leave it to the French to think this one up. Sir John Harrington, the inventor of the flush toilet would love this. 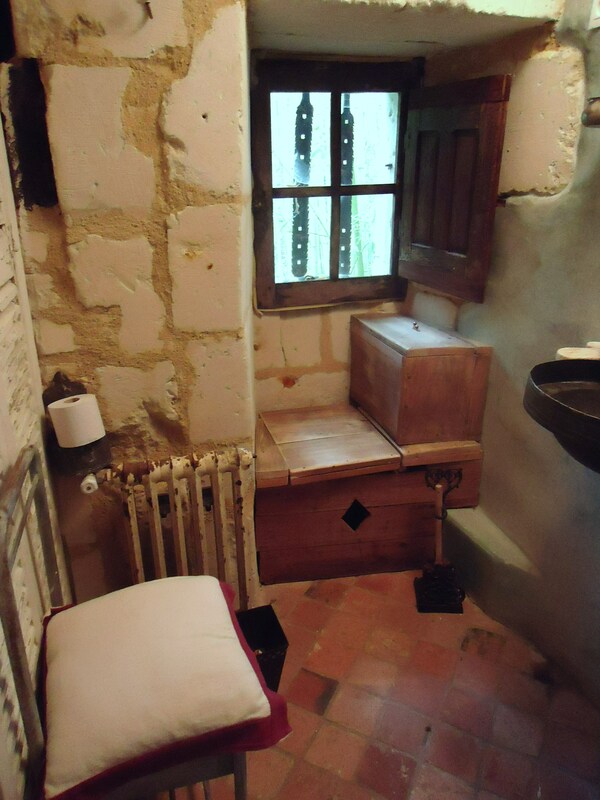 They carved a diamond into the woodwork below the toilet to mirror the diamond shaped windows in the shower. Below is a video of the bells that bid us good-bye the morning that we left “Little Milly”. 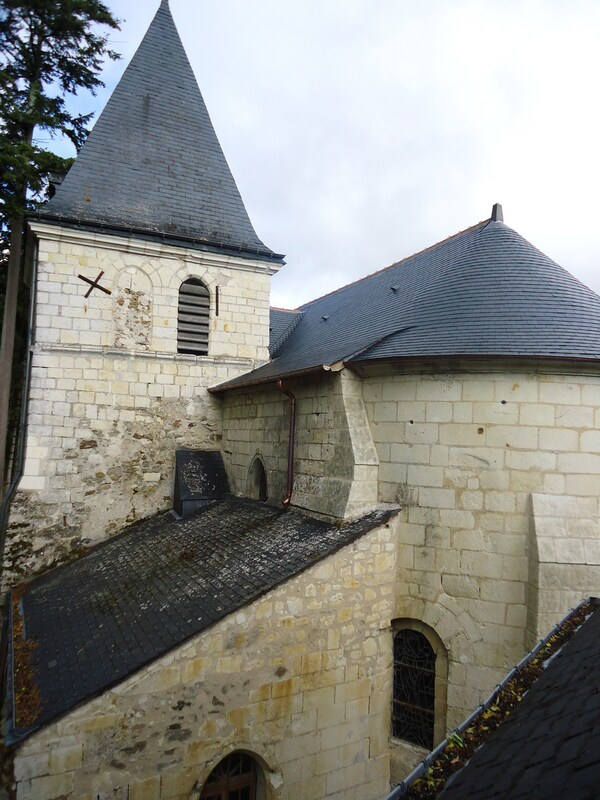 The church of Milly, which adjoins Little Milly, was being restored during our visit. The workmen let us take a peek inside. The photos of the church’s interior and a neolithic dwelling, which was down the road in Gennes, are in the slideshow at the end of this post. So there you have it. 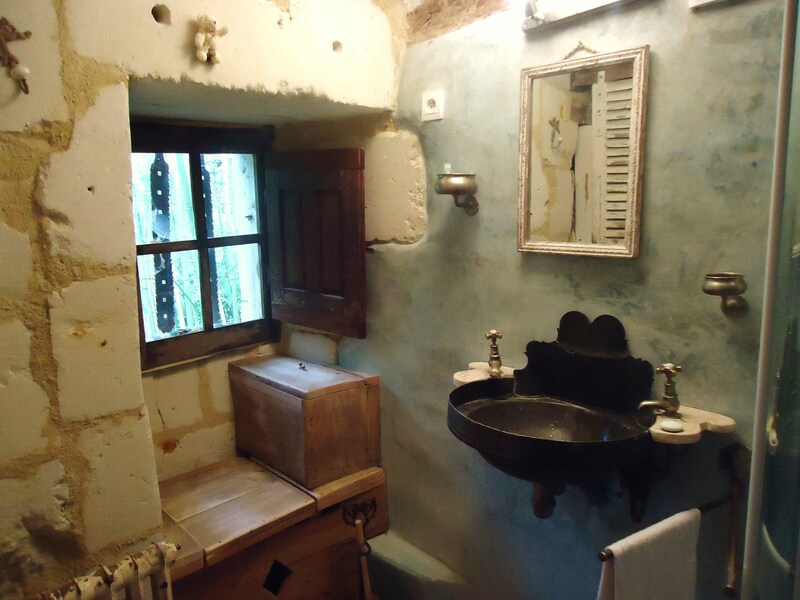 A tour of an old ancient house that was lovingly restored to reflect the patina of hundreds of years of use. 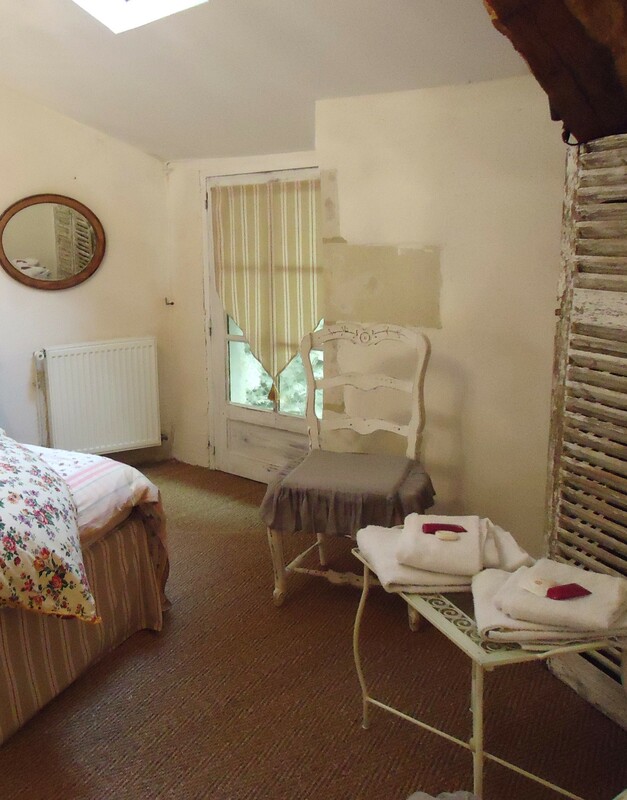 The caretakers were careful to retain Little Milly’s age-old charm of yesteryear and its history while also embracing all the modern conveniences of today’s world. 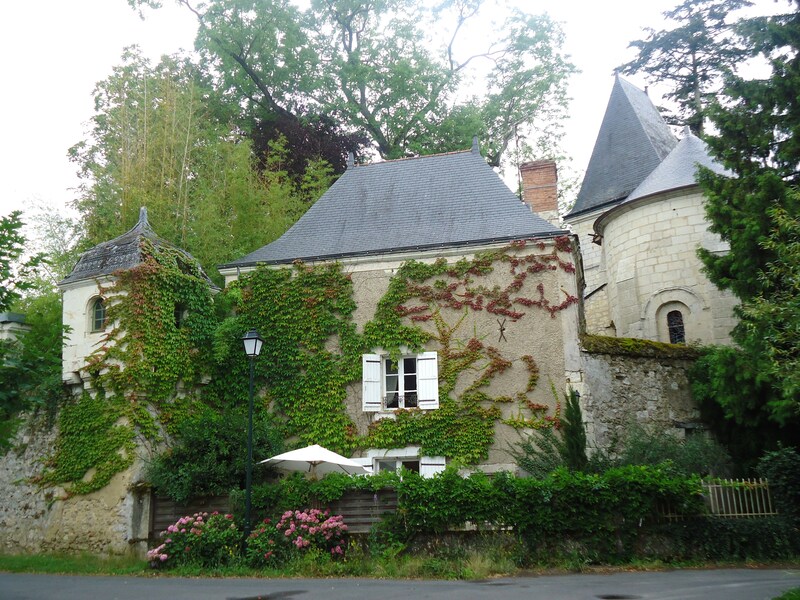 If you ever get the chance to visit the Loire Valley in France the information on staying at this enchanting home can be found through French Country Cottages. Wow…the bells are loud, too! ;P What a neat post. I loved seeing your amazing photos. Thanks for sharing! What a delightful tour…. Love the clever use of shutters throughout!